Gilbert: White potato or sweet potato during the holiday? Are sweet potatoes really healthier that white potatoes? White v. sweet potato: A nutritional debate fueled by misinformation, baseless claims and carbohydrate fears. Here’s what the evidence says — and why they both deserve a place in your diet during the holidays and beyond. Both white and sweet potatoes, when eaten as part of a balanced and intentional diet, provide a fantastic array of nutrients while contributing to the fullness and deliciousness of any meal. If all you want is Vitamin A, then sure, sweet potatoes get the win. But when you pit them against white potatoes for overall nutrition value, it’s a virtual tie. Claim 2: Avoid potatoes because of the glycemic load. Worried potatoes will make your blood sugar and appetite spike? Both potatoes and sweet potatoes fall in the middle to high range on the glycemic load scale. Total carbohydrates and calorie intake has a bigger impact on important health markers. Plus, glycemic load is generally irrelevant to health and leanness because your blood sugar’s response to food varies. Claim 3: Avoid all potatoes because of carbs. Think the carbs will cause weight gain? 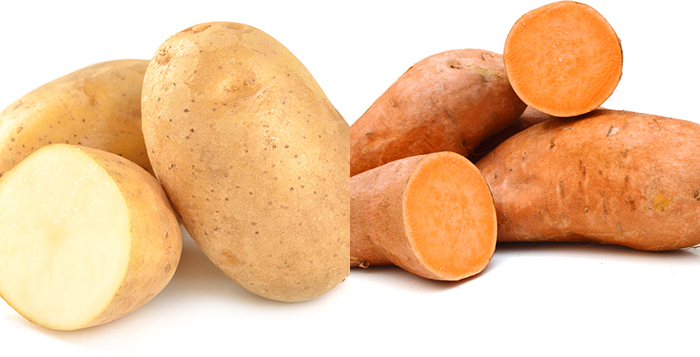 Actually, the carbs in potatoes and sweet potatoes are mostly starch and fiber, which help you stay healthy and lean. Potatoes contain beneficial starch, which, like fiber, doesn’t digest at all. Resistant starch and fiber get fermented in the gut, producing short-chain fatty acids. Short-chain fatty acids may keep you fuller longer, act as fuel for healthy gut bacteria, prevent absorption of toxins, decrease inflammation and decrease risk of colon cancer. Potatoes get a bad rap because they’re often used in high-calorie dishes. In reality, there’s a range of ways in which potatoes and sweet potatoes fit into a healthy diet. Eat more often: Boiled, roasted, baked, olive oil and herbs, topped with salt. Eat less often: Mashed with cream and butter, loaded, fried, chips. Start with 1 to 2 cupped handfuls of your choice of white or sweet potatoes per meal. Then, adjust portion sizes up or down based on Individual goals such as fat loss or fuel for athletics performance, body size (smaller people need less), individual carb needs (higher for active, lean people) and individual preferences. 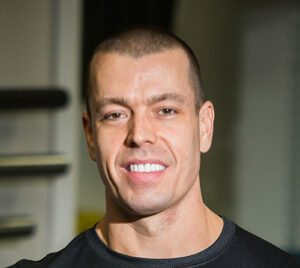 Aaron Gilbert, CSCS, is the owner of Longevity Athletics. This column appears in the December issue of InMaricopa.